Aside from the revenue impact of not having 58 million Americans pay income taxes, economists worry about the social and political effects of having so many people disconnected from the cost of government—a phenomenon known as fiscal illusion. The concern is that when people perceive the cost of government to be cheaper than it really is, they will demand ever more government benefits because they either don’t feel the cost directly or believe that others will be paying those costs. Indeed, when one takes into account those who do not file, about half of all households pay no federal income tax, making the situation particularly worrisome in a majority-rule democracy. Despite these extensive concerns, there has been surprisingly little investigation of any possible linkage between the growth of nonpayers and the growth of government spending or government benefits. After tracking this trend for more than a decade, Tax Foundation economists set out to explore the fiscal consequences of the growing number of Americans being taken off the income tax rolls. A review of the data suggests these concerns are not unfounded. Our analysis finds that in the post-WWII era, there is a very strong connection between nonpayers and federal government transfer payments. Transfer payments are programs that give direct assistance to people such as unemployment insurance, Social Security, Medicare, Medicaid, and food stamps. In fact, our model suggests that a 1 percentage point increase in the share of tax filers who are nonpayers (from 40 percent to 41 percent, for example) is associated with a $10.6 billion per year increase in transfer payments. Since the number of nonpayers has increased by 20 percentage points over the last two decades, our model indicates that in 2010 alone, over $213 billion in transfer payments are associated with this two decade increase in nonpayers. Further, analysis suggests that the increase in nonpayers may also be affecting other aspects of public finances such as the national debt. This is not surprising given that the growth of transfer payments has been a key driver of the growth of the national debt. We find that for every 1 percentage point increase in the share of tax filers who are nonpayers, the debt as a percentage of GDP increases by 0.704 percentage points. For example, if the percentage of nonpayers increased from 40 percent to 41 percent, we would expect the debt held by the public to increase from, say, 70 percent of GDP to 70.704 percent of GDP. This means that the 20 percentage point increase in the share of nonpayers over the last 20 years has increased the debt ratio by 14 percentage points. This research suggests that we are now seeing the fiscal cost of dropping millions of Americans from the income tax rolls in the form of record levels of federal transfer spending and national debt. As lawmakers consider proposals for tax and entitlement reform, they should take into account the fiscal impact of exempting a majority of Americans from the largest source of federal tax revenue. A nonpayer is an individual or couple who, after taking advantage of their legal credits and deductions, has zero or negative income tax liability. This is not the same as those who have overpaid their taxes through paycheck withholding and then upon filing a tax return receive a portion of that withholding back. Table 1 demonstrates how a family of four making $45,000 in adjusted gross income can become a nonpayer under 2011 tax law. After taking a standard deduction of $11,600 and personal exemptions of $14,800 (four times $3,700) the family’s taxable income is reduced to $18,600. The family will be taxed at 10 percent on their first $17,000 of income and at 15 percent for their remaining $1,600 of income, giving them a total tax liability of $1,940. From this, they are allowed to deduct two tax credits of $1,000 for each of their two children. They are also allowed to deduct an additional $214 due to the Earned Income Tax Credit, which is a credit designed to financially assist low to moderate income working families. As the table indicates, subtracting these tax credits from the family’s tax liability brings their $1,940 liability to zero. However, since the child credits and Earned Income Tax Credit are refundable, the family also receives a check for $274 from the IRS for the remaining value of their tax credits. Some families may also be eligible for other credits such as the child care credit, education credit, or the tax credit for purchasing a hybrid vehicle. The tax code has always shielded some Americans from paying income taxes, and the number of nonpayers has fluctuated widely since the earliest days of the code. However, the number of nonpayers of the federal income tax has grown substantially over the last two decades. In 2010, the figure stood at 41 percent, representing 58 million tax filers. Throughout the 1990s, an average of 24 percent of filers paid no income taxes. 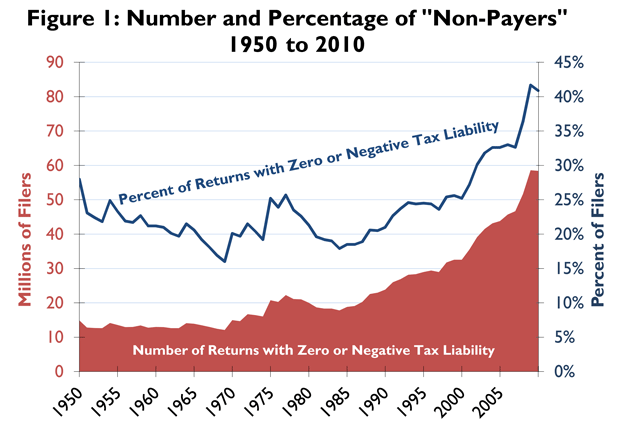 The low point in the modern era for nonpayers was 1969 when only 16 percent of filers had no income tax liability. Figure 1 details the nonpayers trend in the post-WWII era. In 1950, 28 percent of all filers had no income tax liability, largely because of the value of the personal exemption relative to average incomes at the time. As Figure 1 shows, the percentage of nonpayers declined steadily from 1950 until 1969, when it reached its lowest point ever at 16 percent of filers. By 1975, nonpayers had grown to nearly 26 percent of filers before beginning a gradual decline that lasted until the mid-1980s. Since then, the percentage of tax filers with no income tax liability has grown dramatically. Indeed, in the twenty years between 1990 and 2010, the percentage of nonpayers nearly doubled, from 21 percent to 41 percent. There are two main causes of the growth in nonpayers. The first is the increased value of the standard deduction and personal exemption brought about in the Tax Reform Act of 1986. This had the effect of reducing the taxable income for all taxpayers but was especially beneficial for low-income taxpayers. The second, and more recent, cause has been the creation of new and expanded tax credits. Unlike the personal exemption, which reduces a taxpayer’s taxable income, tax credits directly reduce tax liability. These credits have grown in number and value over the past the two decades. In 1990, the combined value of these credits was roughly $20 billion, after adjusting for inflation. Two decades later, the combined budgetary cost of both the basic and refundable tax credits reached a remarkable $224 billion in 2010. Though most nonpayers are low income by conventional standards, the income level at which one can become a nonpayer has crept upward into the middle class over the last decade. In 2001, the share of those tax filers making between $50,000 and $75,000 with no income tax liability was roughly 1 percent. By 2009, that share had jumped to 12 percent., The threshold at which the typical married couple with two children will likely be nonpayers given the standard deduction, personal exemption, and only two dependent child credits is now roughly $47,000. This is without any additional deductions or credits, such as the mortgage interest deduction. There are, however, millions of other Americans who earn some income but not enough to be required to file an income tax return. Currently, the threshold for filing a tax return is $9,500 for a single person and $19,000 for a married couple. By some estimates, when these non-filers are added to the number of nonpayers, the total number of Americans outside the income tax system jumps to roughly 50 percent of all households. However, these non-filers are not considered as part of this paper’s analysis, due to the difficulties of estimating the non-filer population historically. Why the Concern Over the Growth of Nonpayers? Basic economic theory tells us that consumers will respond to a drop in the price of a product by demanding more. By extension, economists predict that as the price of government goes down for a citizen, he or she will then demand more of it. When the cost of government is shifted away from a citizen through deficit spending or progressive taxation, this creates disproportional demand. This phenomenon is known as fiscal illusion. The danger is that if the price of government goes down for enough voters to create a sizable voting block, the overall effect in a majority-rule democracy could be excessive government spending. Though workers pay other federal taxes, such as payroll taxes, as well as state and local taxes, the income tax is the most visible tax that the federal government levies and its largest source of revenue. More importantly, the income tax is the primary means of paying for the basic cost of government, whereas all other federal taxes are either dedicated to specific programs (such as FICA taxes and Social Security benefits or the gas tax and highway funding) or aren’t levied directly on individuals (such as corporate income taxes). Aside from the lost revenues from having so many people off the tax rolls—as much as $22 billion in 2010 alone—another reason to be concerned about excessive government spending is the impact it can have on economic growth and incentives to work. While some government spending, such as infrastructure or education, may arguably have some positive multiplier effects, other government spending can have the opposite effect. In particular, transfer payments can retard economic growth because they redistribute income from working individuals to non-working individuals. Numerous studies suggest that as transfer payments and their accompanying taxation grows, a nation’s economic growth potential and employment opportunities suffer. Research also suggests that as transfer payments increase, discretionary spending (spending other than entitlements and interest on the national debt) such as defense funding or public investments is “crowded out.”  Naturally, this creates a tension between what many see as the core functions of government and major entitlement programs. Lastly, in the absence of hard budget constraints, excessive demand for transfer payments can result in deficit spending. Given that voters are more willing to accept higher deficits than higher taxes, politicians may reconcile the demand for high transfers and low taxes by increasing the national debt. Bruce Yandle and Jody Lipford have previously studied the issue of fiscal illusion related to the federal income tax in their 2012 study, Taxpayers and Tax Spenders: Does a Zero Tax Price Matter? For their study, they examined the progressivity of the tax code instead of the number of nonpayers. They considered both the percent of total federal income taxes paid by the top 10 percent of income earners and the percent of total federal income taxes paid by the bottom 40 percent of income earners, and analyzed how that disparity effects government spending over time. They found that although total federal spending was not associated with a more progressive income tax code, transfer payments and the national debt both increased with strong statistical correlation as the tax code became more progressive. Yandle and Lipford therefore conclude that fiscal illusion related to a more progressive tax code is increasing government spending on transfer payments. We explore the same dynamic but as it relates to nonpayers, mainly because this variable more readily captures the “one man, one vote” aspect of democracy. 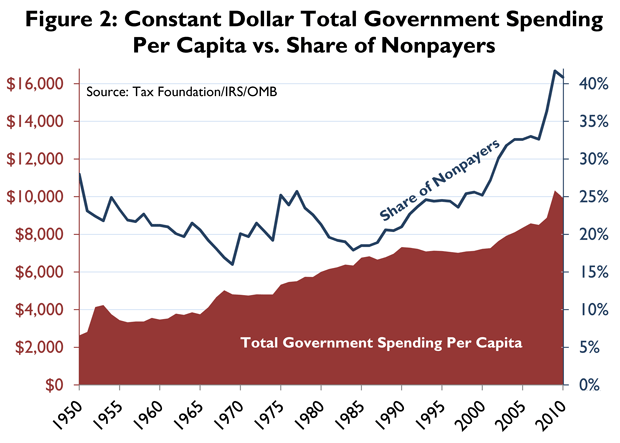 Figures 2 compares the historical trend in nonpayers to the historical trend of total federal government spending in constant 2010 dollars, adjusted for population, from 1950 to 2010. Total government spending for each year is adjusted by the population figure for that same year. This focuses our study on true changes to the scope of government and ignores government growth that is only the result of serving a larger population. We consider the years between 1950 and 2010 for two reasons. First, in the pre-World War II era, only a small minority of the population filed for income taxes, as the income tax was not yet the major source of federal revenue that it would become. By 1950, the base of taxpayers had substantially broadened and the income tax had been transformed into a tax that the vast majority of American citizens were expected to pay. Second, the drawdown of WWII spending and post-war reconstruction created a spike and then rapid decline in spending that is highly irregular and unrelated to fiscal illusion. As we look at Figure 2, we can see that total government spending grew steadily over the 60 year time period we considered, while the percentage of nonpayers fluctuated considerably. It would seem that there is no correlation between the two trends. For example, between 1950 and 1968 the trends seem largely unrelated as the percentage of nonpayers decreased and total spending increased. From the 1970s through the mid-1980s, these trends moved in somewhat opposite directions as the percentage of nonpayers spiked and then fell dramatically, while spending moderated. After 1986, however, both trends have tracked each other very closely. Statistically, we find a weak correlation. When we controlled for other factors (namely age demographics, the unemployment rate, income inequality, and the payroll tax rate) that might impact the growth of total federal spending, we still find a weak statistical connection between the growth of nonpayers and the growth of total government spending. Since nonpayers and total spending do not appear to have a causal relationship, we next consider subsets of government spending: transfer payments and the remaining portion of government spending after transfer payments and interest on the debt. 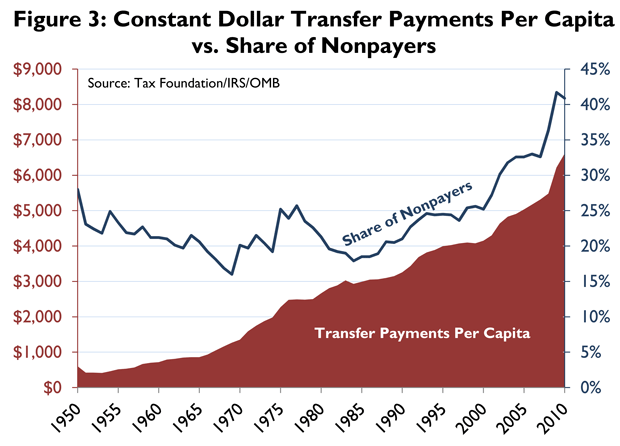 Figure 3 compares the historical trend of nonpayers to the trend of transfer payments between 1950 and 2010 in constant 2010 dollars, adjusted for population. From 1950 through the late 1960s, the growth of nonpayers and the growth of transfer payment spending appear to have very minimal correlation. Government transfer payment spending grows substantially over the period, mainly as a result of Social Security benefits, while nonpayers decline slightly. After the late 1960s, with the start of the Great Society programs, the growth of transfer payments and the growth of nonpayers begin to move closer together. For example, the percentage of nonpayers spiked in 1975 to nearly 26 percent. This spike corresponds to a sharp increase in transfer spending. Over the past 25 years, the two trends seem to track each other quite closely, with both reaching their 60 year peak in 2009 and 2010. 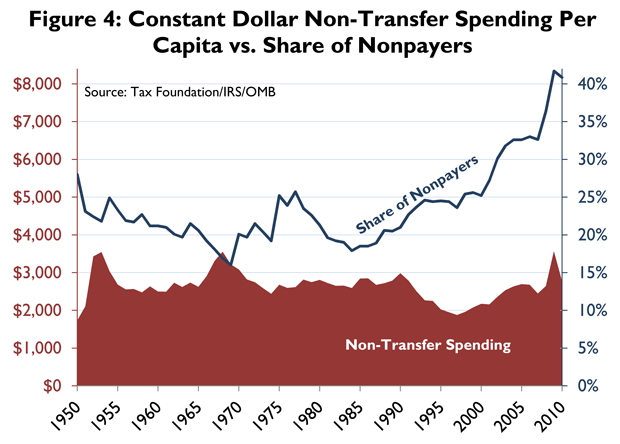 Our analysis indicates that the growth of nonpayers and the growth of transfer payments since 1950 are positively correlated. That is, as nonpayers increase, transfer payments also increase. Moreover, this correlation between nonpayers and transfer payments is strong. The variation in nonpayers predicts 22 percent of the variation in transfer payments. When we account for additional factors that may affect the growth of transfer payments (namely age demographics, the unemployment rate, income inequality, and the payroll tax rate), this correlation between nonpayers and transfer payments remains strong. The results of our statistical model indicate that a 1 percentage point increase in the share of tax filers who are nonpayers (from 40 percent to 41 percent, for example) is associated with a $10.6 billion per year increase in transfer payments. Since the number of nonpayers has increased by 20 percentage points over the last two decades, this model implies that in 2010 alone, almost $213 billion in higher transfer payments resulted from the growth of nonpayers over the last two decades. This represents 9 percent of the total $2,287 trillion spent in transfer payments that year. We also analyzed the relationship between nonpayers and all transfer payments other than the old age and survivors' portions of Social Security and Medicare. Although our model controls for age demographic, we wanted to isolate the effect of nonpayers on transfer payments that are not targeted for retirees. We find that when the old age and survivors' portions of Social Security and Medicare are removed from transfer payments, the relationship between nonpayers and this subset of transfer payments remains strong. The results of our statistical model suggest that a 1 percentage point increase in the share of tax filers who are nonpayers is associated with almost $9 billion per year in increased transfer payments not targeted for retirees (e.g. housing assistance, food stamps, and Medicaid). The results of our model therefore indicate that the 20 percentage point increase over the last two decades in the share of filers who are nonpayers is associated with a $170 billion increase in transfer payments. Given that the total value of transfer payments other than Medicare and the old age and survivors' portions of Social Security was $1.335 trillion in 2010, our model implies that almost 13 percent of these transfer payments are associated with the growth of nonpayers. This result indicates that nearly 80 percent of the total $213 billion effect of nonpayers on transfer payments is specifically on those transfer payments that are not designated solely for the elderly. We next tested to see if nonpayers have any effect on the remainder of government spending, a figure we call non-transfer spending. Non-transfer spending is calculated by subtracting total federal transfer payments and interest payments on federal government debt from total federal spending. Figure 4 details the historical trend of nonpayers compared to the historical trend of non-transfer spending in constant 2010 dollars, adjusted for population. We can see that while both nonpayers and non-transfer spending increase over the 60 year period considered, they do not consistently move together. During most of the years between 1950 and 1986, they don’t appear to move together in any meaningful way, except for a few brief periods that they appear to move in opposite directions, such as between 1964 and 1970. Then from 1998 until 2010, they both increase together. When we statistically test the relationship between nonpayers and non-transfer payment spending we find there is no relationship. This is true even after accounting for other factors that may affect non-transfer spending, namely age demographics, the unemployment rate, income inequality, and the payroll tax rate. The lack of a relationship between nonpayers and non-transfer spending does not seem intuitive in light of our results linking nonpayers and transfer spending, but there are some possible factors that explain this result. One possible factor is that in terms of voter behavior, non-transfer payment spending largely does not go directly into the hands of voters. Instead, this spending is often composed of indirect investments and the benefit from this spending is widely dispersed among all voters. For example, national defense programs benefit all citizens but the benefits are generally not seen for years due to the time it takes to develop and implement weapons programs. Such spending directly and immediately benefits relatively few voters, namely producers of such services and investors in those producers. Moreover, demand for various types of non-transfer spending may be hitting the point of diminishing marginal returns, meaning that demand for such spending is largely satisfied and voters do not see substantial benefits in increased spending. Therefore, voters are less sensitive to a lowering of the price of these services. Finally, budget constraints mean that increases in transfer payments are forcing cuts to, or “crowding out,” non-transfer payment government spending. It is not clear which of these factors, or which combination, is driving our result. Since transfer spending is putting a strain on the budget, transfer payments may be forcing more spending to be financed by debt. 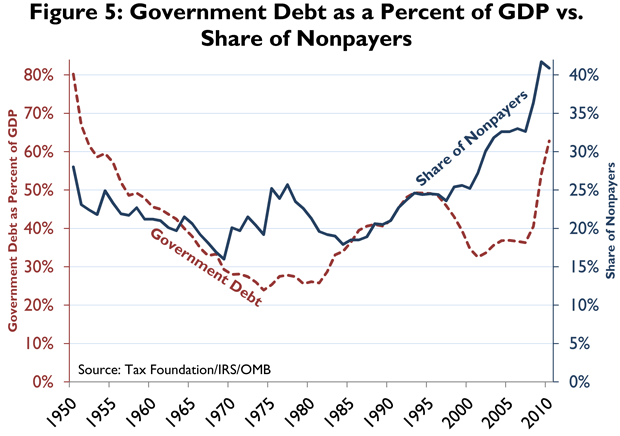 Figure 5 details the historical trend of nonpayers compared to the historical trend of government debt as a percent of GDP. An examination of this chart shows an irregular relationship between nonpayers and the national debt. From 1950 until roughly 1968, both nonpayers and government debt decline. This makes sense because, all other things being equal, as the number of nonpayers declines, more revenues will be raised. However, from 1968 until 1984, the trends sharply diverge and move in the opposite direction: nonpayers increase before subsequently decreasing, while debt first decreases and then subsequently increases. From 1984 to 1996, the trend lines once again follow each other closely as both increase at similar rates. Then nonpayers and debt diverge from 1996 until 2007 as nonpayers continue their growth but debt as a percent of GDP declines. Debt then begins to grow again from 2007 to 2010 and nonpayers grow similarly. It is not clear from a simple visual analysis of the trends in Figure 5 whether there is a correlation between nonpayers and the federal debt. However, statistical analysis shows the two are positively correlated (as nonpayers increase, so too does national debt). That relationship remains after controlling for other factors affecting the level of government debt, namely age demographics, the unemployment rate, income inequality, interest rates on government debt, and the payroll tax rate. We find that for a 1 percentage point increase in the share of tax filers who are nonpayers, the debt as a percentage of GDP increases by 0.704 percentage points. For example, if the percentage of nonpayers increased from 40 percent to 41 percent, we would expect the debt held by the public to increase from 70 percent of GDP to 70.704 percent of GDP. This implies that the 20 percentage point increase in the share of nonpayers over the last 20 years has increased the debt ratio by 14 percentage points. Our analysis indicates that this is occurring because nonpayers increase demand for transfer payments, which is then partially financed by deficit spending, since voters are averse to higher taxes. The record growth in the percentage of Americans who pay no federal income taxes because of the generosity of the credits and deductions in the tax code has received much attention recently. One obvious concern is over the lost revenues to the federal treasury at a time when Washington is running trillion-dollar deficits. But there is also reason to be concerned about the broader political and fiscal consequences of disconnecting 58 million Americans from the basic costs of government. We find that the growth of nonpayers is strongly associated with increases in transfer payments and the national debt. Indeed, the twenty-year growth in nonpayers is associated with more than $213 billion in increased transfer spending and a 14 percentage point increase in the debt-to-GDP ratio in 2010 alone. These findings imply that when voters perceive the cost of government to be cheaper than it really is, they demand ever more government benefits because they either don’t feel the cost directly or believe that others will be paying those costs. Our results indicate that the dire fiscal straits we are now in, and which much of Europe is struggling with as well, can only be responsibly addressed through a more balanced tax burden. In particular, so long as income taxes fund the largest part of government spending, exempting half the population from income taxes is not a sustainable fiscal model. Debt accumulation and eventual default await those democracies that fail to connect a majority of voters to the cost of government spending. All dependent variables examined in this study come from federal government budgetary data (spending and debt levels) provided by the Office of Management and Budget. All spending variables (total federal spending, transfer spending, non-transfer spending) are in constant 2005 dollars and are in per capita terms. Aggregate government debt held by the public is examined as a percent of nominal gross domestic product, therefore correcting for the size of the economy and inflation. Regarding independent variables, data on nonpayers of the federal income tax comes from Internal Revenue Service data and Tax Foundation calculations. Unemployment figures come from the Bureau of Labor Statistics and use what is known as “U3” or “official” unemployment. Data on the percent of population under 15 and 65 and over comes from the U.S. Census Bureau and a database provided from the Organization for Economic Co-operation and Development. Marginal payroll tax rates come from the Social Security Administration. The income share of the top 1 percent of earners comes from data compiled by economist Emmanuel Saez and available for download on his personal website. Interest rates on 10-year government treasury securities come from the Office of Management and Budget. All regressions performed in this paper rely on the Newey-West method to deal with serial correlation and heteroskedasticity, which is prevalent in regression analysis of time series data. Additionally, all regressions relied on the year-over-year changes in data, and not the absolute value of data. This was done to overcome a unit root issue with the data, as indicated by the Dickey-Fuller test. The Dickey-Fuller test indicated that after using year-over-year changes in the data, this issue was resolved. Finally, all regressions “lag” the nonpayers variable by one year. This is in part because this represents the average of the two year federal election cycle. Federal elections are in part the conduit through which changes in public opinion might manifest themselves in federal policy. Moreover, different variables used in this study do not have corresponding annual timelines (i.e. standard calendar year vs. federal government fiscal year). Because of this, matched year regressions, single year lagged regressions, and two year lagged regressions were all examined. A single year lag was found to consistently provide the most robust statistical connection between nonpayers and the federal budget. A detailed description of the methodology used in this study will be presented in a forthcoming working paper. Table 1 below summarizes the results of the bivariate regression examined in this paper. Table 2 summarizes the results of the multivariate regressions examined. Coefficients are the top number in the table and standard errors are in parentheses below. Jody Lipford & Bruce Yandle, Taxpayers and Tax Spenders: Does a Zero Tax Price Matter?, The Independent Review, Spring 2011, http://www.independent.org/publications/tir/article.asp?a=879. See Tax Policy Center, Baseline Distribution of Tax Units with No Tax Liability, Current Law, 2004-2011, Table T11-0173 (June 14, 2011), http://www.taxpolicycenter.org/numbers/displayatab.cfm?Docid=3054&DocTypeID=7. See also Memorandum from the Joint Committee on Taxation, Information on Income Tax Liability for Tax Year 2009 (Apr. 29, 2011), http://finance.senate.gov/newsroom/ranking/download/?id=9fe27e9f-a5e0-4010-8461-ffc00b5c00ef. Hypothetical tax return generated using Tax Foundation’s MyTaxBurden tax policy calculator. This hypothetical return can be viewed or modified at: http://goo.gl/jYIFT. For more on the history of nonpayers and causes of recent growth, see William Freeland & Scott Hodge, Tax Equity and the Growth of Nonpayers, Tax Foundation Fiscal Fact No. 200 (July 20, 2012), https://taxfoundation.org/article/tax-equity-and-growth-nonpayers. William Freeland & Scott Hodge, Tax Equity and the Growth of Nonpayers, Tax Foundation Fiscal Fact No. 200 (July 20, 2012), https://taxfoundation.org/article/tax-equity-and-growth-nonpayers. The IRS has not published a time series of the share nonpayers at various income level that is inflation adjusted, making changes in nominal income brackets the best data available. This makes comparing year-over-year changes imprecise, but the growth of nonpayers at higher income levels is still demonstrated by this figure. For reference, $1000 dollars in 2001 has the same buying power as $1,211.39 in 2009. Thomas Saez finds 85 percent to 96 percent of the population files an income tax return since WWII, making the population of filers a sufficient proxy of the total population over the period. See Thomas Piketty & Emmanuel Saez, Income Inequality in the United States, 1913-2002 (Nov. 2004), Table A0, http://emlab.berkeley.edu/users/saez/piketty-saezOUP04US.pdf. This figure is calculated by taking the total taxable income of all 58 million nonpayers in 2010 (just under $220 billion dollars) and applying the rate from the lowest federal income tax bracket (10 percent) to their taxable income. Using the rate from the lowest tax bracket under the current tax code gives a baseline estimate relative to current tax policy. It also worth noting that this figure is in addition to the $114.7 billion that these nonpayers received in refundable tax credits in 2010. Will McBride, Not All Government Spending is Fiscal Stimulus, Tax Foundation Tax Policy Blog, Aug. 15, 2012, https://taxfoundation.org/blog/not-all-government-spending-keynesian-stimulus. Gabe Horwitz, David Kendall, & Jessica Perez, Collision Course: Why Democrats Must Back Entitlement Reform, Third Way: The Economic Program, July 2012, http://content.thirdway.org/publications/564/Third_Way_Report_-_Collision_Course_Why_Democrats_Must_Back_Entitlement_Reform.pdf. All data on the federal government’s spending and debt comes from the federal Office of Management and Budget. A detailed list of a data sources is included in appendix A.
 Saez finds 85 percent to 96 percent filed after 1949, versus less than 20% prior to WWII. See William Freeland & Scott Hodge, Tax Equity and the Growth of Nonpayers, Tax Foundation Fiscal Fact No. 200 (July 20, 2012), https://taxfoundation.org/article/tax-equity-and-growth-nonpayers. See also Thomas Piketty & Emmanuel Saez, Income Inequality in the United States, 1913-2002 (Nov. 2004), Table A0, http://emlab.berkeley.edu/users/saez/piketty-saezOUP04US.pdf. A brief review of statistical methods and tables displaying all empirical results are available in this paper’s appendix. This is based on current levels of population, given that the figure is in per capita terms to correct for the effect of a growing population. Regression analysis of the data available does not allow us to conclude with absolute certainty what the direction of causation between nonpayers and transfer spending is. As a matter of statistics, it is possible that the growth in nonpayers may be caused by the growth in transfer payments since transfer payments reduce the incentive to work, therefore increasing nonpayers. However, we do know that the growth of nonpayers is largely caused by changes in tax and budget policy (the introduction and expansion of tax credits), so this is exceedingly unlikely to be the case. Similarly, a case could be made that the growth in nonpayers, government spending, and the national debt may be the result of a broader change in the public’s acceptance of, or demand for, government redistribution. This would mean that though the changes in nonpayers and transfer payments are correlated, their movements are caused by another underlying factor: public opinion. Such quick and massive swings in public opinion are exceedingly rare but absent additional analysis, this possibility cannot be ruled out. Social Security disability payments were not removed from total transfer payments because these payments are largely not designed to address income security and poverty among the elderly. Debt is adjusted by GDP instead of population because this is a more common metric of a nation’s public debt burden. The debt figure used in this paper is publicly held debt, not gross debt. Similar to the relationship between nonpayers and transfer spending, we cannot determine the direction of causation between nonpayers and transfer payment spending with absolute certainty, only that a strong statistical relationship exists that is exceedingly unlikely to be the result of chance correlation.